i’ve been trying to clean up my life these days. trying to eat better. exercise more. green up my environment and so on. something i’ve always been concerned about is antiperspirant and deodorant. all the aluminum and paraben and awful pore-clogging, alzheimer-causing ingredients really freak me out so i decided to go a more natural route. sounds simple enough. there are so many natural and safe alternatives out there to choose from now days. i thought it would be as simple as picking one that had a scent i liked and that would be it. well… it didn’t turn out to be that easy after all. i’ve gone through at least 8 different ‘alternatives’ over the past 6 months but i think (at last) i’ve found one that works for me. none of the following actually keep you dry since they are deodorants and designed mainly to mask odor. 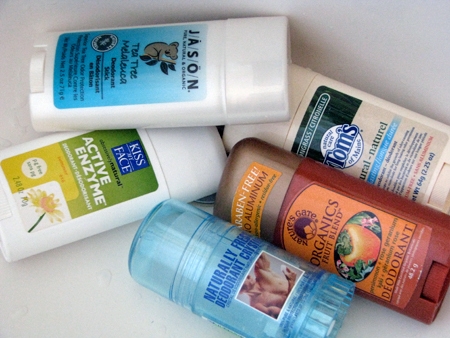 antiperspirants stop wetness but to do so they need to contain much harsher ingredients so they were out. tom’s of maine (lemongrass and citronella): this one looked promising. goes on kinda sticky and wore off after about an hour. left me with wet, sticky armpits. but it smells pretty good! although it made me crave thai food every time i wore it. haha. must have been the lemongrass. kiss my face (summer fresh scent): sucked. wore off soooo quickly and left my clothes smelling like sweat. the summer fresh scent was anything but. naturally fresh (deodorant crystal): hmmm… i’m told you really have to dedicate yourself to these crystal deodorants. they say after a couple months of diligent use your body adjusts and the crystal becomes pretty effective at masking odor and keeping you dry. nope. at least not in my case. nature’s gate (persimmon and geranium): LOVE the scent. this is the one i used the most mainly because i really liked the scent. it was natural smelling. kinda herbal and not overpowering. but it goes on sticky and stays that way and it wore off very quickly and you have to reapply too often. on to the next. LUSH (Aromaco Deodorant): Since the other LUSH product seemed to cause a reaction, i thought i’d try another of their milder deodorants. this one doesn’t keep you nearly as dry as the aromacreme, but it does effectively mask any unpleasant odors. unfortunately it does this with patchouli. you either love patchouli or you hate it. i do not hate it, but i certainly do not love it. another failure. Adidas (Cotton Tech): a friend turned me onto this one. it promises to keep you dry using cotton tech (whatever that is) to whisk away wetness. goes on super thick and sticky. wore off super fast and i didn’t like the scent. oh well. J/A/S/O/N (tea tree deodorant stick): a winner at last! goes on nice and smooth and not sticky at all. keeps me pretty dry. even after a heavy workout. the smell is light and fresh. you do need to reapply if you’ve had an active day but this deodorant really holds up to day to day without too much worry. and so 6 months later…success. although i shouldn’t get too excited yet since the real test will come this summer. will J/A/S/O/N hold up in the warmer months? i really hope so.